In April 20, 2009 Hyundai Elevator Company's Test Tower known as Asan Tower, located at Icheon, South Korea surpassed its Japanese rival Mitsubishi Electric Corporation's Lift Testing Tower at Inazawa City, Japan, (see #2). With a height of 205 metres (673 feet) it now holds the record of being the Tallest Lift Tower in the World. Source of Info and more info: http://joongangdaily.joins.com / Official Web Page of Hyundai Elevator Co. Credits: Special thanks to S_Mori for informing me about the correct location of the lift testing tower. 3. Nippon-Otis Elevator Test Tower, Shibayama, Chiba, Japan. Located in Nippon-Otis factory at Shibayama, Chiba, Japan, this lift tower is second tallest in the World with a height of 154 metres (505 feet). However its shaft goes down another 27 metres (89 feet) below ground, thereby making it longest in terms of shaft length with a total of 181 metres (594 feet). The lift tower of Otis Quality Assurance Centre at Bristol Research Centre, Bristol, Connecticut, USA is America’s tallest elevator test tower. It stands 117 metre (383 feet) high equivalent to a 29 story building and started its operations in May 1987. Though this tower is shorter than the historic Express Lift Tower at Northampton, England (see #5) but I have placed it at at #4 because the Northampton tower is currently not in use. 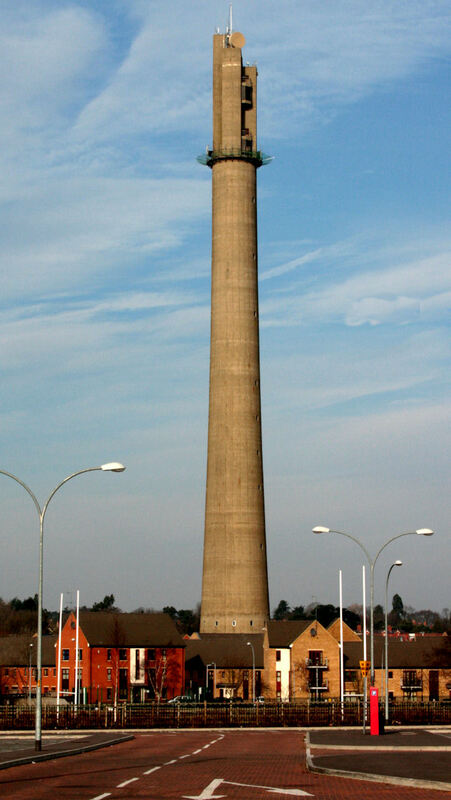 This 127.45 metres (418.1 feet) tall Lift testing Tower of Express Lift Company, located in Northampton, England is the tallest tower of its kind in Europe and ony one and first of its type in England. The tower was a land mark in the country and was officially opened by Queen Elizabeth II on 12 November 1982. In January 1997, the tower fell out of use after Express Lifts was taken over by Otis and subsequently closed. It is understood that after some renovation and repairs the tower will soon be restored to its original purpose. The tallest tower was newly constructed by HITACHI in 2010.